Say what you want about the troubles at VW, but the German car company does make solid, well-engineered vehicles. Over the past few years, the VW Passat and VW Golf have won numerous awards, mostly for handling, ride, tech features, and comfort. The 2017 VW Passat is not a Herculean leap forward in terms of raw unadulterated innovation, but it has a good mix of features that are becoming standard on most new vehicles—namely, the adaptive cruise control that adjusts your speed for the car in front of you. 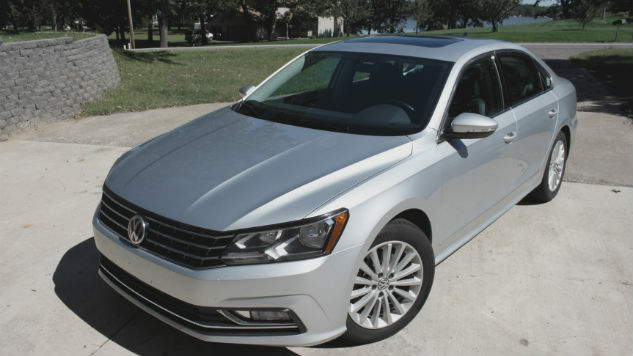 This is not a Tesla Model S, and you could make an argument that the Honda Accord has a few extra tech perks (I like the one that shows you a live video off to the side of the car when you change lanes), but as an all around sedan, the Passat made me want to drive more… and drive faster. Surprisingly, this all comes at a price that’s easily under $30,000 with some of the tech packages added or $22,440 for the base model. That’s highly affordable for many new car buyers, and a hair under the Accord, the Fusion, and the redesigned Nissan Altima. Compared to all of those cars, I liked driving the Passat the best. It’s a driver’s car. The handling is a bit more precise, and you can use the Sport mode for a bit more punch. The SE 1.8T model I tested has a turbocharged engine, at a cost of $26,280 which is still reasonable. In almost every way, the Passat is a C-A-R in what seems like a ding but is more of a praise. It feels quiet on the road with minimal road noise. In the back, you can stretch out a little—it has much better legroom than most sedans I’ve tested, although at 6’ 2” my head was almost touching the roof. (Does anyone make a backseat that lowers besides Audi and BMW? Not sure.) For five adults, the Passat was one of the most comfortable passenger car rides I’ve had in months. I even took one to a drive-in theater and preferred sitting in the seats to a lawn chair. With the 170-horsepower engine, you won’t win any races but there’s enough power that you don’t have to listen to the engine whine like a cat every time you floor it. If you visit the VW page for the Passat, you’ll see that there are tech packages that include lane-keeping warnings, parking sensors, and other perks. My test car only had adaptive cruise, and it worked without the typical jerkiness you’ll find on lower-end sedans. My one complaint is that the display above the steering wheel looks a bit like an arcade game from the 70s, the one where you shoot at spaceships and everything looks like it uses a dotted line. As usual with VW cars, this is one I’d purchase. It drives smooth, it’s punchy enough, the steering is tight, and the tech features are enough to keep up with the trends.